But who were the top performers individually on the day? We’ve put together a quick list of the biggest highlights of the final day of men’s competition. Remember, be sure to tune in tomorrow at 5pm ET on ESPN2 for the conclusion of the Championships with women’s finals. Andre De Grasse. Andre De Grasse. Andre De Grasse. Just keep saying it. 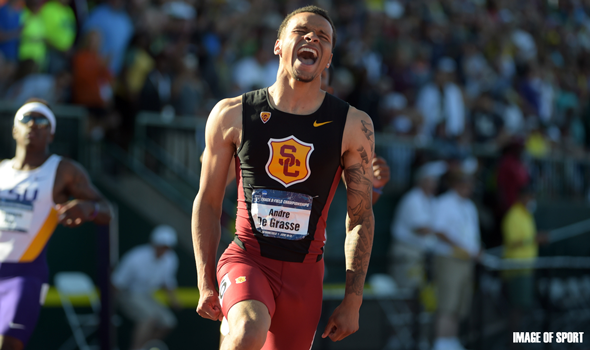 Andre De Grasse. Not quite out of nowhere—but then again certainly no one saw this coming—Andre De Grasse is now one of the fastest men in the history of the planet. Andre De Grasse. Andre De Grasse, a Canadian in his first year in the NCAA and third full year on any kind of track & field team, answered lots of questions on Friday night at Hayward Field and brought up a few more. @ryanflotrack It’s ruined legit attempts at sprint doubles, ruined relays with short recovery time, and segregated the sexes. Great. It’s hard to consider a sprint double more legit than the one that Andre De Grasse just pulled off. His 100 is the second fastest all-conditions time by a collegian; only Obadele Thompson’s 9.69 at the elevation of El Paso with a healthy 5.0 meters per second tailwind is faster. Per this calculator, De Grasse’s 9.75 with a 2.7 mps tailwind is equivalent to 9.87 with no wind—faster than Ngoni Makusha’s 9.89 collegiate record. (For context, Thompson’s 9.69 in El Paso is worth a 9.90 on the same calculator) His 200 is the fastest ever by a collegian in any conditions, any time of year. No collegian has ever cracked 19.60 before today—not in a pro meet in the summer, and not with a J-shaped tailwind. 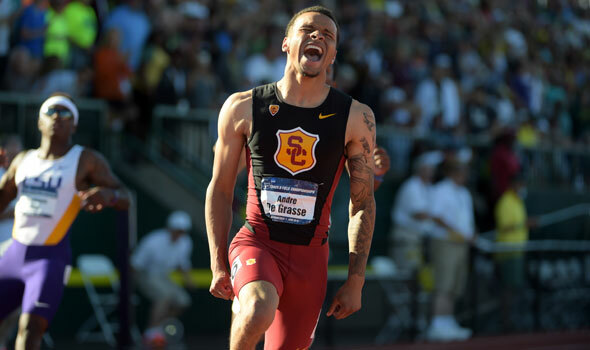 In fact, comparing De Grasse’s double to other collegiate marks is a little unfair to it. He’s the fifth fastest man in the history of the 200 meters in all conditions. Even including wind-aided marks, only a couple of guys named Usain Bolt, Yohan Blake, Michael Johnson, and Walter Dix have ever covered half a lap faster than De Grasse did today. Tyson Gay ran a wind-legal 19.58 in 2009. His 100 mark isn’t far behind on a global scale. Again in all conditions, 9.75 ties De Grasse for No. 8 on the all-time world list in the 100. Other studs rounded out doubles on Friday night, though no one else won two individual titles in one day. 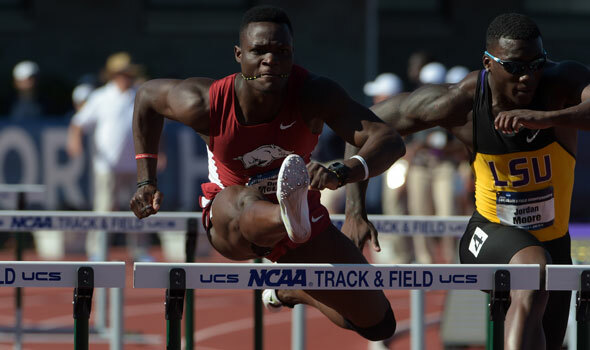 Arkansas’s Omar McLeod came the closest, leading off the winning 4×100 and winning the 110 hurdles in a ridiculously fast time just forty minutes later. McLeod and Jarrion Lawson will get most of the pub for the Razorbacks’ relay win. But Baylor’s relay with Trayvon Bromell didn’t even make the final, and De Grasse’s USC squad only finished fourth in the final. So props to Kenzo Cotton and Marqueze Washington, who helped Arkansas win their first ever title in the event. For a program with such rich men’s track history—the richest—Arkansas bona fides in the 4×1 and 110s clearly needed a little shoring up. They hadn’t scored in the short hurdles since 2004, and they hadn’t had a winner in the event since Clyde Scott in 1948. McLeod ended both of those droughts on Friday evening in less than an hour. His winning time of 13.01 in the 110 hurdles final was aided by an ample tailwind of 3.9 meters per second. That breeze disqualifies it from record eligibility, but only Renaldo Nehamiah ran faster in all conditions in college. McLeod’s win makes him the first to win the indoor and outdoor short hurdles since 2009. Two more men won their second event of the championships after starting the meet with a win on Wednesday. Marquis Dendy of Florida and Edward Cheserek of Oregon were the point-scoring bulwarks for the top two track & field teams in the country, and are going to go down among the best ever collegians in their event area. Dendy’s collegiate career is over, so let’s start with him. We covered Wednesday’s long jump win here; he added another triple jump trophy to his case on Friday. The Gator finishes college with seven NCAA titles, among the most ever by any athlete in any discipline. The last six came in one of the most dominant stretches of horizontal jumping in collegiate history, as Dendy swept the long and triple jumps at the outdoor championships last year and the indoor and outdoor championships this year. 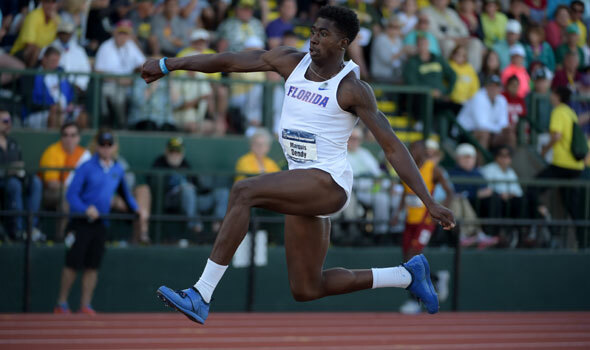 He gave Florida their sixth straight outdoor triple jump win in monster fashion. Per Tom Lewis, here’s Dendy’s place in history. He’s the first to sweep long and triple jump titles in consecutive outdoor NCAA meets since Arkansas’ Robert Howard (1997-98) and the first to sweep the long and triple in three straight national meets since Arkansas’ Mike Conley. Conley did so in four straight nationals in 1984 and 1985. 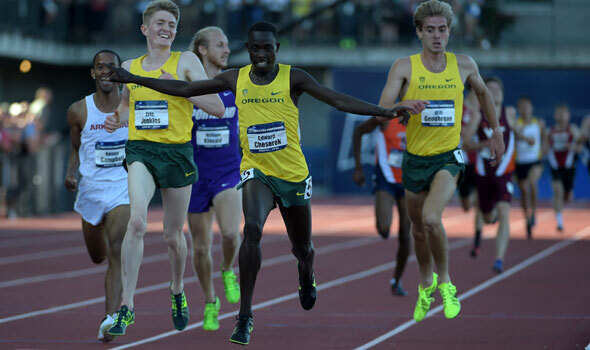 With his collegiate career now exactly halfway over, Cheserek has six track & field and two cross country national titles in the bank. His most recent in the 5k helped clinch a team title for the Ducks, though after the results of the 4×4 came in, it turned out that Oregon’s win margin was so fat that they could have scored zero points in the 5000 and still won the meet. The King moved to defend his throne with a little more than 300 meters to go, but teammates Eric Jenkins and Will Geoghegan, along with Arkansas’s Kemoy Campbell and Portland’s William Kincaid, stayed within striking distance. He started swinging his arms wide in that signature off-kilter stride with about 120 meters to go, and though Jenkins and Campbell were right there, it was never in doubt. Cheserek is the best distance runner in the NCAA, and the second half of his college career starts now. 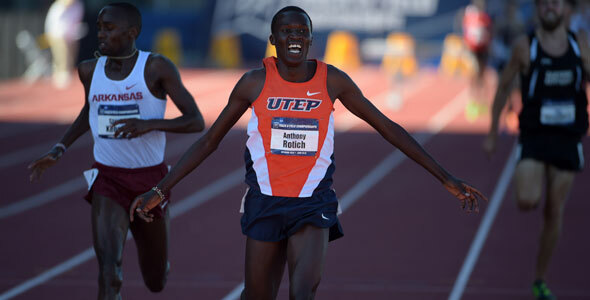 Stop us if you’ve heard this before: Anthony Rotich of UTEP is the NCAA Division I 3000-meter steeplechase champion. We should be stopped, because this is now the third year in a row you’ve heard that phrase. Not since Arkansas’ Daniel Lincoln won consecutive titles in 2001, 2002 and 2003 has one man crossed the line first in the steeple at NCAAs. He had to once more outduel another Arkansas man in Stanley Kebenei for the win, stymying a surge from the now-two-time national runner-up to win by less than half a second in 8:33.90. Both men made it over the final barrier cleanly – remember, Kebenei stumbled over it a year ago to rob us of what would most likely have been a similar finish – and Kebenei pulled right alongside Rotich, but Rotich had just enough of an extra gear to hold him off. Rotich closed the final lap in 57.93, while Kebenei clocked a 58.23 for the final lap. That’s three wins and a sixth-place finish as a frosh for Rotich for 33 career points; that makes him the second-highest scorer in meet history in the event (when converting all past results to the current 10-8-6-5-4-3-2-1 system) behind only UTEP’s James Munyala’s 38. Final-round wins and upsets in the throws have been the norm this week, and that was a trend that continued Friday in the discus. Collegiate leader Rodney Brown of LSU fouled each of his four final throws to finish ninth overall and defending national champion Hayden Reed finished 12th and missed the final, opening up the field to a big upset for the second year in a row. It appeared for the longest time that it was going to be Tavis Bailey of Tennessee who would take the win, as his 203-2 (61.92m) led all the way through the final round. One man who knocked on the door several times was Sam Mattis, who came up four centimeters and three centimeters shy of Bailey’s lead in the second and third round. Knock on the door long enough, though, and someone might answer. 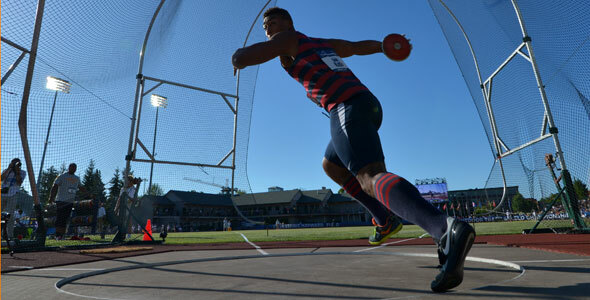 On his sixth and final throw, he launched a career-best 205-0 (62.48m) to seize the lead from Bailey. Bailey had one final chance to respond, but he finished with what was his fourth consecutive foul since that early leader. Mattis’ title was the first discus crown in program history and the first national title in any event since Brian Chaput won the javelin in 2003.